Growing up in Southern California presented an incredible opportunity to Sierra Reed Milne when she was scouted for a modelling career at a young age, which in turn gave her the chance to travel and experience other cultures. After gaining a following on the 18th season of Survivor, she dreamed of becoming a television travel program host, but couldn’t have imagined that it would be realised in New Zealand. It was here that she began her wine journey after working closely with the Family of Twelve, a journey that has led to her marrying an Australian, and making her own wine based in Victoria. Check out my Let’s Taste video of one of her wines here! Before entering the wine industry, Julian had a successful and diverse career in the film and advertising industries, until he desired a more peaceful life on a vineyard. 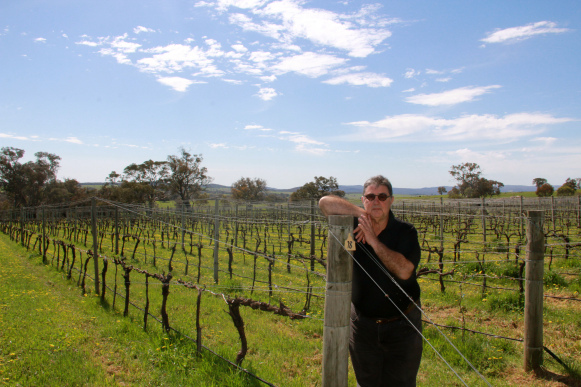 He scoured Australia for his slice of heaven but “kept coming back to Beechworth” in Victoria, eventually establishing Castagna Vineyard at 500m on granite soils. Due to his fascination with and affinity to biodynamic European wines, he became the first official biodynamic vintner in Australia, and an ambassador for biodynamic agriculture in the country, organising such fantastic events as the Return to Terroir tastings. Randall Pollard is a name in Victoria synonymous with independent fine-wine sales, having worked in the industry for almost 20 years before opening his own wine store in Geelong (Randall’s), and then importing a range of outstanding artisan wines from France and Europe (Heart & Soil). His love of wine stems from sneaking glasses of wine from the cask at the age of 15, enjoying it with cheese and bread. He shared more stories from his career on this episode of The Vincast. Bibendum as I have said many times, are one of the best importers of wine in Australia. For the first time they hosted a tasting of their entire range of Spanish producers, and some were gracious enough to fly all the way to Australia for the event. Here is a very long list of wines I tasted. Nice gun flint volcanic notes. Clean pure fresh light, classic but fairly simple and safe. Slightly rich and creamy, toasty and crunchy texture. Pure fresh light, clean and brisk, friendly and appealing. A bit deeper and richer, bolder but still nice and salty, sweeter fruit character. Zingy zesty, so fresh, not what you think of manzanilla. Fig skin and herb notes. Exquisitely balanced, light but not thin. Mid-palate texture saltiness. Bright fruit-driven but savoury. Quiet. Bright and fresh, fruit-forward, nice and textural. Salty volcanic oily nose. Much more elegant and restrained. Classic but restrained and dry, fresh musky floral elements. Tight and sharp, very precise, really good but not offering a lot. Nicely developed, slightly wilder and more mineral. Bright juicy floral notes, fresh and juicy but tight and straight. Tighter spicier and leaner, much more savoury. Intense tight concentrated, juicy and fairly soft but intense. Amazing precision and integration, LENGTH. A little dirtier and wilder, dark and intense. Tight juicy round full friendly. Wilder funkier basalt, intense super godello up to 11. Wild but a little short, lacking something. Herbal green fig, very fresh and food friendly. Denser and more lifted aromatically, brisk concentrated quince like, high acids. Spicy wild earthy, generous yet tight. Denser tight, softer and fuller. Not seeing it, might need more time. Too funky and wild, tougher more traditional and rustic. Closed and developed, tight focused acid great. Juicy fruit (musk) sweet, quite different, more Loire style. Soft bright juicy clean, pleasant character, exceptional value. Tighter more integrated, much more traditional. Deep and soft, juicy reflection of the variety. Juicy fresh red fruit sweet. Bold juicy dark and intense, fairly straight-forward. Denser earthier and fuller, quite vintage specific. Tighter grainier and earthier, very generous. Intense tight precise and still closed. Stinky reduction, bright wild salty. Juicy hot still very fresh. Very intense dark almost molasses, very soft easy and generous. Wild earthy savoury, soft concentrated, REAL. Rounder larger fuller, not too different in fact. Wild earthy savoury, unbelievably tight. Light fresh pure lean and clean. So elegant but hauntingly complex. Beautifully floral yet spicy, intense and tight, extremely long. Darker more brooding and more fruit sweetness. Toasty smoky earthy wild terroir wine. Toasty caramel nose, rich but still dry, wild and feral. Creamier honeyed spice caramel, salty richer rollier. Neville Yates imports wines from Europe, South Africa and New Zealand under his Eurocentric banner. I was first introduced to him when I was the wine buyer for King & Godfree, tasting a few of the wines with him. On my journey I visited some German wineries and caught up with several more at Prowein, leading me to surmise that he has one of the best collection of German producers in Australia. His range is eclectic at times with more than a few ‘natural’ producers that come up with some interesting examples. He was showing some of the new arrivals at Pei Modern in Melbourne. Very classic metodo classico nose. Generous fruit, fairly simple and clean on the front, hint if creamy texture. Fairly developed open autolysis notes, very yeasty bready. Nice oxidative citrus. Cleaner tighter yeast notes. Rounder more earthy savoury dark berry notes, heavier on the pinot noir? Open generous ripe red fruit nose, but tight fine and crisp savoury texture on the palate. Fine pure but very complex cheesy charcuterie nose. Bold full expressive combination of red citrus and subtle savoury meats. Oak dominant chardonnay style. Soft gentle vanilla creamy texture, some white peach. Sharp fig kiwi skin, overly leesy. Flat and dull. Rich creamy buttery chardonnay openness. Overworked flabby lacking focus and crispness. Nice developed stone fruit and oak maturity integrated. Bold and generous but not heavy or hot, fairly rich and creamy from malo, but elegant and complex. Much more exuberant and flintier, more citrus than stone. Fuller smokier toaster, better malo integration, dense. Big whack of ripe creamy juicy pineapple. Fairly soft subtle but showing that sweet vanilla pineapple crumble character. Spicy quince apricot kernel. Open light round spice fruit friendliness. Clean pure lime sherbet. Crisp very light pure and excellent for the price. More intense mineralic ripe deep fruit notes. More intensity and character, fuller fresher. Slightly earthy red soil minerality, subtle orange sherbet. Bold texture, generosity and density of fruit and acid. Open savoury earthy natural wild style. Subtle subdued broad. Singular. Candied oxidised pear banana caramel. Nondescript middling Alsace wine. Intense quince floral kumquat notes. Density of viscosity and sugar, nice bite of acidic quince notes. On the stripped side, de-acidified? Flat on the finish. Nice density and ripeness. Great depth and character, dry sweet well-balanced. Spicy savoury mineral complexity, nice lively fruit profile, round and yet brisk. Very quiet subtle nose, but delivering plenty on the palate, wonderful length and focus, but plenty of personality. Wild green pepper spice fig. Generosity yet exquisitely balanced sweetness. Loving this producer. Nice talcy flinty lifted citrus floral minerality. Bold full viscous sweetness, but just a hint of complex savouriness. Nice generous soft rich ripe but not heavy. Still plenty of life but looking simple currently. Big tropical passion fruit. Delivers exactly what people want and is very good to boot. Smells like pure honey. But still dry. Interesting, not sure it’s great though. Hipster wine? Interesting texturally. Different in terms of fruit to Vouvray etc. Clean sharp precise but good personality. Most certainly a food wine. Nice soft berry notes. Still on the sharp acidic side, a little aldehydic. Tight brisk, great balance of dark fruits and spicy mulberry. Bright fresh sufficiently savoury spicy but light and friendly with a touch of length. Earthy savoury spice, base of dark fruits underneath. Round soft yet fresh savoury red berries. A tad too much sweet oak. Lovely bright floral notes. Tight crisp a little green but fresh acids. Bold full of fruit and juby, but still crisp fresh and light, with some nice carry on the palate. Precise mineralic pure focused and very crisp. Light clean yet not without personality. Beautiful shellfish expressive fruits. Pure and tight yet intense, a touch warm and generous but linear. Very floral rosy pomegranate musk. A little too light and without body and character. Bright intense juicy plum and hints of clove. Soft mellow yet fresh and friendly. Sweet core of fruit lingers. Quite shy and subtle. Very savoury textural but enough flesh to fill the mouth and soften. Tough to assess without food. A touch different, quite rustic stinky. Surprisingly dense and full, quite tannic and bold in dark fruit. Almost aggressive on the front. Bold earthy rustic slightly oaky notes. Not as heavy and full as you’d expect, expressive but still light and fresh. Super tight and intense, will take a whole to open up. Earthy generous atypical of the variety. A little simple, product of the vintage. Spicy and peppery of all things. Broad generous and forward but earthy red fruits. Spicy and dark plum fruits. Bold intense builds in the palate, good whack on the back palate. Classic vintage expression. Bold brisk textured generous but balanced focused and fresh. Nice delicate berry components. Bright fruity musky nose. Clean pure fresh safe sancerre. Very shy flinty brisk citrus, subdued. A bit dirty but certainly has personality. Worth looking at a different vintage. Classic aromatics, fresh clean and slightly fruit sweet, focused and persistent. Nice savoury texture. Open and clean, classic example of the vintage. Tight clean fresh vibrant exquisitely balanced minerality and sweetness. Nice clean precise cherry nose, delicate. Fresh balanced long and pleasant. Some earthy burnt elements, a touch dirty. Old-school style, very savoury and grainy textural, good acidity. Little fruit. Spicy crushed clove. Hmmm tight and a touch volatile. Not really. Nice intense sweet dark plum notes, just a hint of spice. Full juicy building texture spice and acidity. Very fresh yet broad appeal. Warmish. Very tight intense acidity. Exceedingly fresh and linear.